Using a spoon, spread a thin layer of shaving cream in the bottom of the pan. All you need is a shallow coating. Dot the surface of the shaving cream with food coloring. Run the tines of a fork through the colors in a wavy fashion. Try not swirling your colors or else they will run together. Lay your paper on top of the colored layer in the pan. Smooth the paper out over the shaving cream. Remove the paper and wipe the shaving cream off with a dry paper towel. If you do this carefully, none of your colors will run or be distorted. Allow your paper to dry. If it curls, you can have an adult iron it flat using low heat. Now you can wrap your holiday gifts with your own decorated wrapping paper. In chemistry, absorption is a chemical or physical process where one substance takes in another substance. 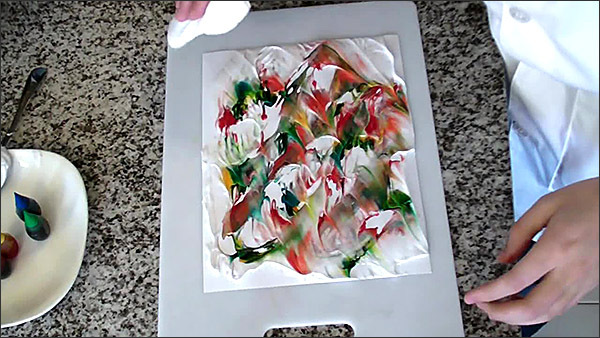 In this experiment, the shaving cream is absorbing the food coloring and the computer paper then absorbs the colors. In result, we get multi-colored gift wrap paper. Try using scented shaving cream and see how it effects the end result. Was the paper able to absorb not only the color, but the smell as well? What happens if you do swirl your colors together in pan? What color or colors will your paper end up being? What happens with the end result, if you use notebook paper instead of computer paper? Did it work? Does it absorb the colors better or worse?